Another Tree Dance is a project of reconciliation and renewal in the life of the artist Karinne Keithley Syers. An interdisciplinary solo performance, it creates a serene yet demanding meditation on a life commitment to open-ended process. Through sonic, visual, choreographic, and textual excursions into landscapes of navigation, bewilderment, and sudden clarity, Another Tree Dance invites us to walk out into the world with a new sense of wonder and an ear for what Ralph Waldo Emerson called the “severe harmony” of the relentlessly ebbing and flowing energies that form our experience. Bessie Award-winning Karinne Keithley Syers is an interdisciplinary artist working in performance since 1995. She is the founder and co-editor of the 53rd State Press, publisher of new performance writing. 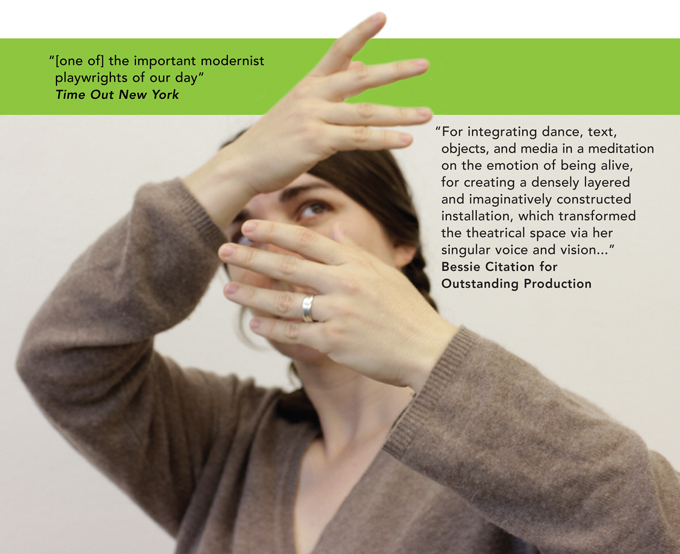 Sara Smith is an interdisciplinary artist, choreographer, and librarian who lives in Western Massachusetts. She is the founding editor of KINEBAGO, a forum for writing about dance and movement research in New England. Another Dance Tree is commissioned by The Chocolate Factory Theater and will premiere in October 2013 as part of its Visiting Artist Program.